Commune, Communicate, Commemorate with those who have gone on before us. 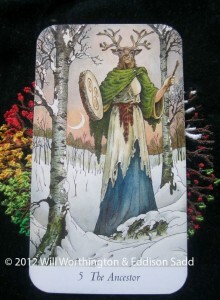 It’s Halloween and our lovely wrangler, Arwen of Arwen Tarot, gave us this brief: “It’s Samhain or MidFall. This is the last of the three harvests in the Northern Hemisphere and the advent of Spring in the Southern hemisphere. It is a time that I know as being a thinning of the veil…a time for the honouring of those who have crossed over before us. This will be a hop focused on communing, communicating and commemorating our loved ones. If I could ask my grandparents a question or two about their lives, I’d have to pick my maternal Grandmother. She’s been “felt” around my life a few times, but I usually send her away with a snarl and a reminder to never darken my thoughts again and for a while, she hasn’t. In life, I really didn’t know her, I don’t remember her at all. In truth, she has more peace to settle with my mum than she does with me, but that’s over and done wi’. She’s buried now, I cannot change that. But if I wanted to open the veil….?? I do know, she read tea leaves at one point, then stopped doing so when my mum was in her teens. I never knew why. I never got to ask her if some of my gifts come from her side and why she never passed on those skills to my mum. Did she read cards at all? Playing cards, perhaps? It got me to thinking, if she could answer me in Tarot, what would she say? I did ask for the reveal to be in a dream but I didn’t get a reply that I can remember! 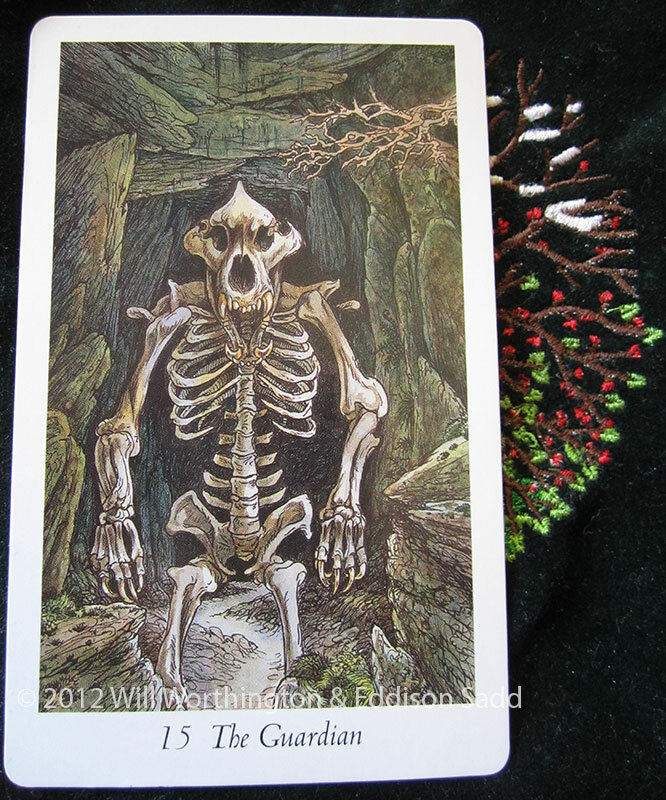 However, the Ancestor card is certainly one to pull out of this fabulous deck, since I’ll be asking to commune with my ancestors. 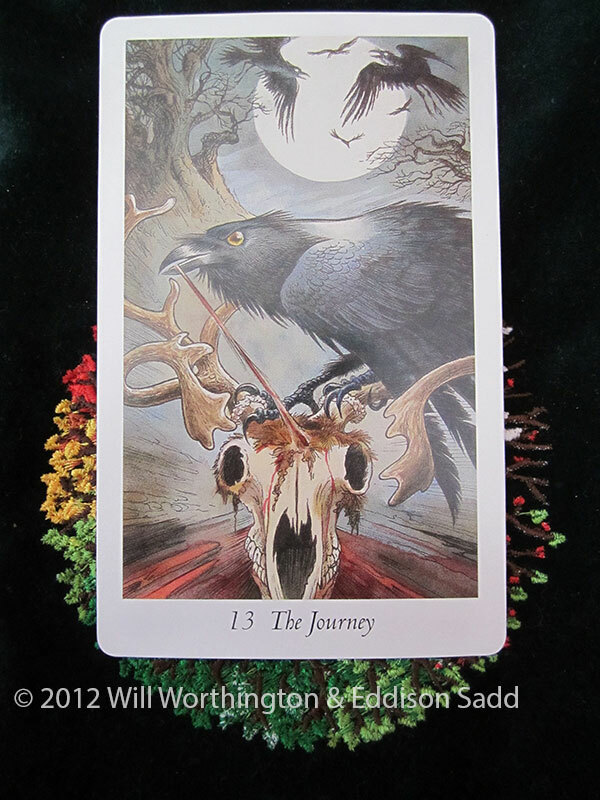 Another card that might come into play is The Journey Card. This is certainly about the ending of a cycle, the end of not knowing what my chosen ancestor was like, how much of her is really within me. It’s about taking what is useful and then using it in a clever, constructive way. Not easy, but certainly do-able. 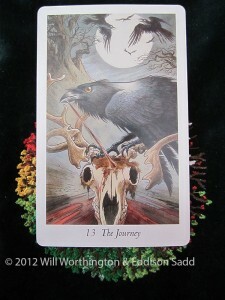 The ravens are the guardians of the spirit of the dead. What doesn’t serve us, needs to be recycled and let go, so that we can make way for the future. 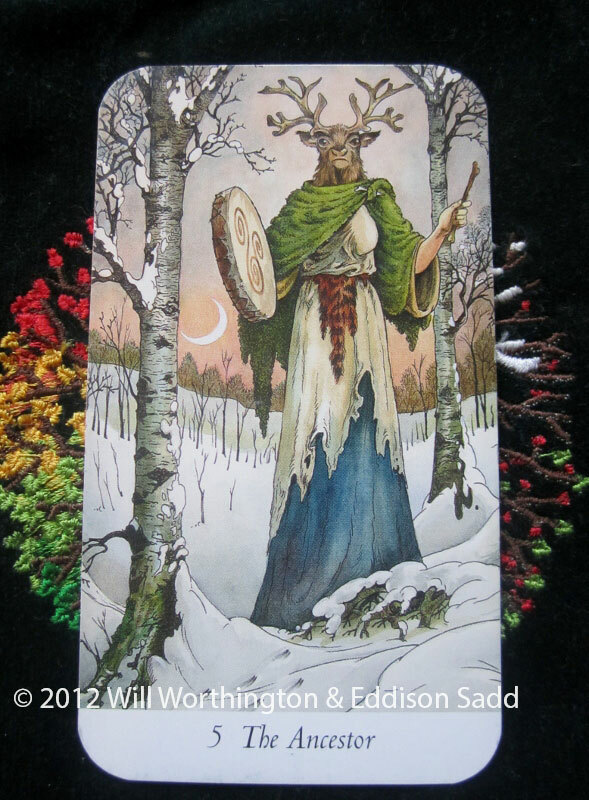 The final card for me this season is The Guardian. He’s the Challenge that lies before us and as afraid as we might be, we can’t move forward until we face that unknown. Are you afraid of him? If you’re not, you’re either a Fool or a God who has nothing to fear, but (and Star Trek, TNG reference here) even Q had lessons to learn. So, for my sanity (or what might pass as sanity) I’ll meditate with my grand-mother this Samhain and put my ghosts to rest. I know she’s been ready to commune with me for ages, but I have not. Now, I am, so I’m going to do this. Guardian, bring it on. Hope my post wasn’t too dark for you! If it were, Chloë (going forwards) or Morgan (heading backwards) might have something lighter for you. But she’s been around again, so, lets get this conversation over with. Yes yes! Do tell! I am eager to know what she has to share:) this is a beautifully written post my dear Louise. I think a little darkness is appropriate for this time of year 🙂 I wish you well as you open up to communication with your grandmother! What a cliffhanger of a post! Maybe you should do a tea leaf reading for her to speak to you. At any rate, I’ll be watching to see the resolution!